Be the first to share your favorite memory, photo or story of Velsie. This memorial page is dedicated for family, friends and future generations to celebrate the life of their loved one. 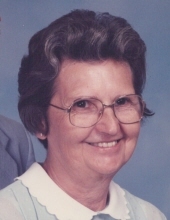 VELSIE BELCHER ELSWICK, age 93 of Abingdon, VA, passed away Saturday, April 13, 2019 at Valley Healthcare in Chilhowie, VA. Born in Dickenson County on December 14, 1925. She was the daughter of the late Bart and Dolly Belcher. She was a member of Macedonia Church of Christ in Abingdon, VA. She was a retired nurse of 42 years from the Old Grundy Hospital. She was preceded in death by her husband, Ruey Elswick, of 50 years, 6-Brothers: Moscoe Belcher, Otto Belcher, Johnny Belcher, Donny Belcher, Ricky Belcher and Michael Belcher; 1-Sister: Elsie O’Quinn. She is survived by 4-Sisters: Patsy (Ray) Shortridge of Abingdon, VA, Lois (Ralph) Strunk of Atwater, OH, Sue McKinney of Johnson City, TN, and Omega “Mickey” Stiltner of Chilhowie, VA. She is also survived by 4-Special Nieces: Rayetta Taylor, Sherry Baldwin, Scherona Newsome and Verlaunda Self, which shared a special and unique relationship with Velsie. Velsie was a wonderful sister to all her siblings. To hear her tell it, she was the only “Good One” growing up. She had to keep them all in line. In her later years she didn’t go visit them much but talked to them often on the phone. You could always depend on her telling you all about her day when you called and wanted to know what was happening in your day too. Although she was not blessed with any biological children of her own, she had many throughout the years. She was a mother to all those that she came in contact with in the Pediatric Department at Grundy Hospital in the years she worked there. She was also a mother to all her nieces and nephews, especially Jaime and Brayden Self. She worried about them just like a mother would. She will truly be missed by all who knew and loved her. Graveside Services for VELSIE BELCHER ELSWICK will be conducted Wednesday, April 17, 2019 at 1:00 P.M. at the Mountain Valley Memorial Park, Big Rock, VA, with Pastor Russell Baldwin and Minister Ron Musick officiating. Active Pallbearers will be James Self, Bart McKinney, Jordan Newsome, Brayden Self, Chris Baldwin and John Wesley McKinney. Honorary Pallbearers will be Jason Newsome, Mike Newsome, Ray Shortridge, Butch Stiltner and Rick Taylor. Grundy Funeral Home of Grundy, VA is honored to serve the family of VELSIE BELCHER ELSWICK. To plant a tree in memory of Velsie Belcher Elswick, please visit our Tribute Store. "Email Address" would like to share the life celebration of Velsie Belcher Elswick. Click on the "link" to go to share a favorite memory or leave a condolence message for the family.